For volunteer information and sign-up links, please visit the event home pages on our website. You can access to these pages from our home page by clicking on an event name in “All events” section. Performance Rally events involve closing roads, securing service parks, managing spectator areas, and keeping track of everything going on. Volunteers are the life-blood of any rally event, with each one playing an important role in allowing the events to run safely. Here is a peek at the various roles volunteers take on at the events. 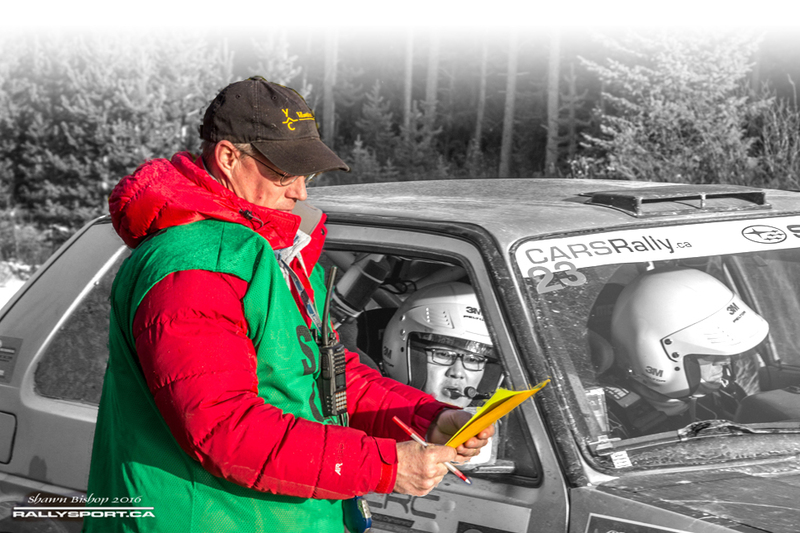 Under the direction of the event scrutineer, you will help inspect the rally cars and ensure they are prepared and maintained to CARS standards. This is your best chance to get an up-close look at rally cars and see how they are prepared. This role helps spectators stay safe while watching the competition from within the bounds of a designated spectator area. Generally speaking, spectator areas offer some of the best views of the rally, although there are plenty of other great spots in the stages. In this role you physically block a side-road or trail and ensure that non-rally traffic is kept off the stage road. Often these positions will be filled with amateur radio operators so that any breach of the stage can be called in to the organizers immediately. In addition to blocking the side roads, radio blockers are asked to track cars as they pass and help identify any cars that may have stopped on the stage. While blocker locations are often remote, they can also have some of the best views and you’ll definitely have a good feel for how the event is progressing. Licensed Amateur Radio operators are in high demand at our rally events. In addition to being used in blocker locations, radio operators fill a range of key positions including start and finish controls, course cars, service park, and net control operators. Radio operators are the backbone of any event’s safety net. You’ll be at the start or finish of a stage, dealing with the timing of the event by checking cars in, assigning start times, sending cars into the stage, or recording their finish time. These roles often have some interaction with the teams and are a great place to get the closest exposure to sounds and smells of rallying. Rally is all about time, and every step the teams take needs to be done on time. The start, services, and finishes are important time controls during the event and offer a different view of the sport. The Stage or Control Captain/Commander is the senior volunteer for either a specific control or for an entire stage. They will have the knowledge and experience to set-up and run a stage and provide the training needed by new volunteers. Course opening cars drive the entire rally route ahead of the competitors, making sure every aspect of the course meets the safety plan and that the roads are properly secured. Course Car crews will all be long-time volunteers or competitors and will have the experience to look at situations anticipate the risks and make quick decisions to mitigate them. Course Closing and Sweep vehicles run at the back of the pack of competitors and ensure the cars make it through the stage and help lightly stuck cars get back on the road. Closing crews will have a mix of rally volunteer and competition experience and vehicle recovery experience and equipment.